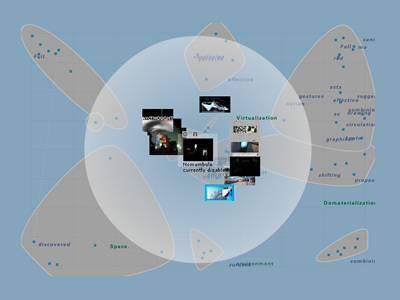 This Semantic Map is part of the netzspannung.org project that is lead by Monika Fleischmann and Wolfgang Strauss at the MARS Exploratory Media Lab, Fraunhofer Gesellschaft - Institute for Media Communication. The netzspannung.org project is funded by the German Ministry for Education and Research (BMBF). 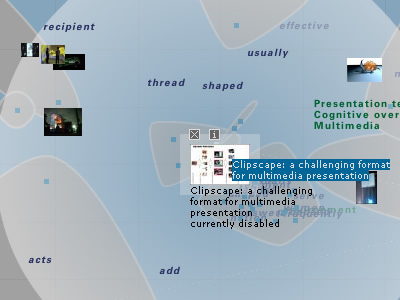 The basic idea behind the Map is to graphically present and communicate the content of the netzspannung.org database as well as visualizing metadata about the content. The graphical visualization presents the data in a intuitive way, so the constellations of the data form a statement about their contextual surroundings. They are part of the netzspannung.org tools.